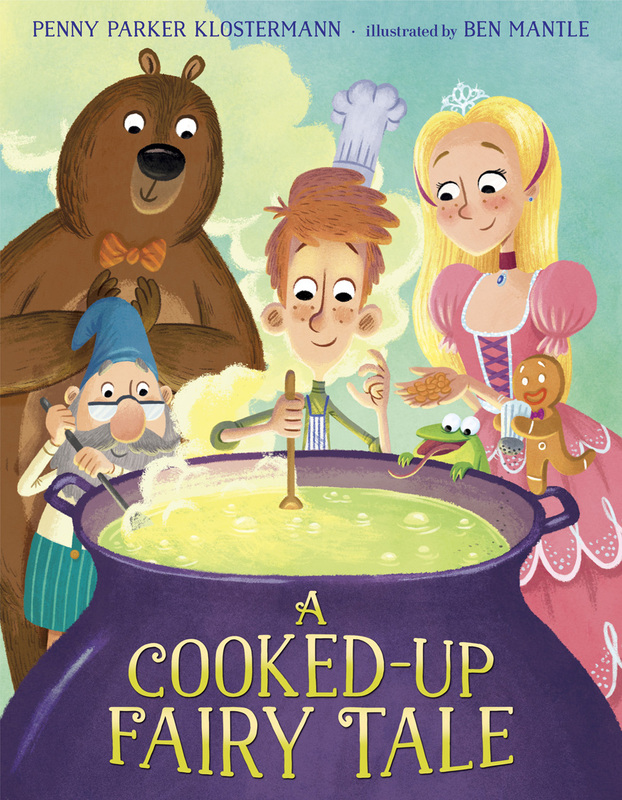 Today we feature picture book illustrator Ben Mantle and his latest book, A COOKED UP FAIRY TALE, written by Penny Parker Klostermann (Random House Books for Young Readers). 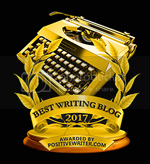 Be sure to enter the giveaway for a copy of the book, provided by the author, Penny Parker Klostermann! Tell us about your background and how you came to illustrate children's books. Well, to be honest, it was a bit of a fluke. I trained as an Animator at University and was working away at an Animation studio, mainly designing characters and backgrounds, when me and a few colleagues decided we would have a local exhibition. I did 5-6 large illustrations for it that had a subtle narrative running through each picture, and it was this that got me thinking about pursuing Illustration. I started freelancing in Animation and at the same time sent off my portfolio to various Agencies in the UK and didn’t think much of it at the time. A few months later I got an email from The Bright Agency, who asked me to come in for an interview and subsequently offered to represent me, and I leapt at the chance! 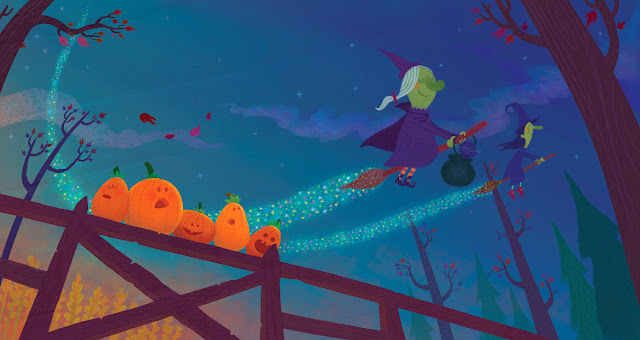 It was probably a month later that I got my first job with Bright, illustrating a Halloween book called FIVE LITTLE PUMPKINS for HarperCollin and I’ve been busy working on Children’s books ever since. Congrats on your recent book, A COOKED UP FAIRY TALE! 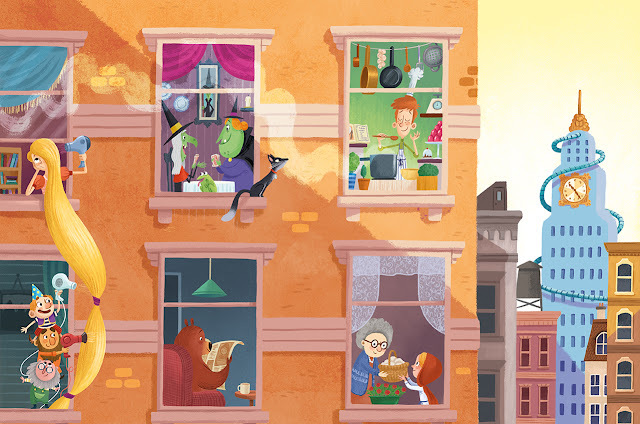 How do you approach illustrating a picture book when you get the manuscript? Thank you! I pretty much always start the same way. I read through the text many times and then start to quickly draw characters and moments from the book that stand out to me and that feel important in terms of the story. I will then flesh out the characters more until I find something that fits. It is often the character design that influences everything else for me. From there, I often make a concept image. This helps me know what the book will look like and influences everything that comes after. Then I will make little thumbnail sketches to plan out the pages before enlarging them and creating life size roughs for the book. I now make a lot of my rough sketches digitally, as it gives me the flexibility I need to make quick changes. From here, it making the final art, which usually combines watercolor crayons, pastel combined with digital colouring. How does your animation background influence your illustration style or approach? It has definitely had a big impact. The artists that I really look up to are mostly from the Animation world. Disney artists Mary Blair is so good with colours and mood and Gustaf Tenggren whose work on Pinocchio, I just adore. I would also put Raymond Briggs, Bill Patterson and Hayao Miyazaki in the list too. The skills you pick up working on Animation are invaluable too. Thinking about character, world building, pacing, storyboarding, not to mention the observation skills that really help with posing and composition. I generally can tell an ex-animator in publishing because of these skills. I’m just finishing a lovely book for Simon and Shuster written by Linda Sarah. She has such a lovely way with words, that her writing has a very poetic style to it. Art wise, it is maybe a bit more grown up than I have done before too, so I hope people like it. And I’m just about to start a new project for Random House, the same publishers as A COOKED UP FAIRY TALE. Which is a great story, written by Christopher Healy about a book that might not be what it first seems. It is very funny and charming and I think people will love it! Find what you enjoy and work hard at it. 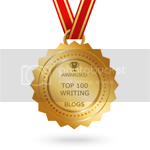 It’s easy looking from the outside to underestimate or just not see the work involved in writing and illustrating. I don’t really subscribe to the idea that talent plays a big part in your success. It definitely helps, but you have to really want it and be willing to give up whatever is necessary. Oh, and don’t forget to be lucky. There’s definitely been some serendipity involved in my career that I can take no credit for at all. Maybe try to get pooed on by a bird or carry a rabbit’s foot with you at all times. I hear they bring luck. Oh gosh! This is tricky! I play quite a bit of volleyball….no that’s not good enough. Okay, I love me some karaoke. And my personal favorite to belt out is Toni Braxton’s ‘Unbreak My Heart.’ I’m not even ashamed. I think people will look back in generations and agree with me that it is a tour de force of singing/song writing….maybe. Other than the Toni Braxton fan website, I have my own website, that gets updated a few times a year, but I’m always on Instagram under the name @benmmantle.and have a facebook page too! They are the best places to find my work for sure. Ben was born in Leamington Spa in 1980, and developed a very early interest in things artistic, designing programme covers for school productions and even coming first in his local library colouring-in competition. From there he went on to study animation at Surrey Institute of Art & Design, graduating in 2003. He then gained valuable experience working on Tim Burton's “Corpse Bride” before moving to Brighton to work as 'Head of Animation' in a media company, focusing on Character and Background design. He was also part of the Animation team creating the BAFTA winning 'Big and Small' CBeebies website. Since 2008, Ben has been working as a Children's Book Illustrator from his shared studio in Brighton and he also produces screen prints and digital artwork to exhibit. He illustrated 'Callum's Incredible Construction Kit' which won the Bishop's Stortford Picture Book prize 2013. Gorgeous cover! I also looked up "Five Little Pumpkins," but the Instagram picture seen above seems to show a more recent, even nicer, version of the cover that does not appear at Amazon. Love these illustrations! Thanks for sharing your illustration process and career journey! I LOVE Ben's style! And have followed him for a while. I agree that former animators tend to glom onto making picture books quite well. It's that narrative storytelling and "camera angles"! Love the comment - find what you love and work hard at it...Love your illustrations. I can certainly see your animation experience in your illustrations. Just fantastic, Ben! 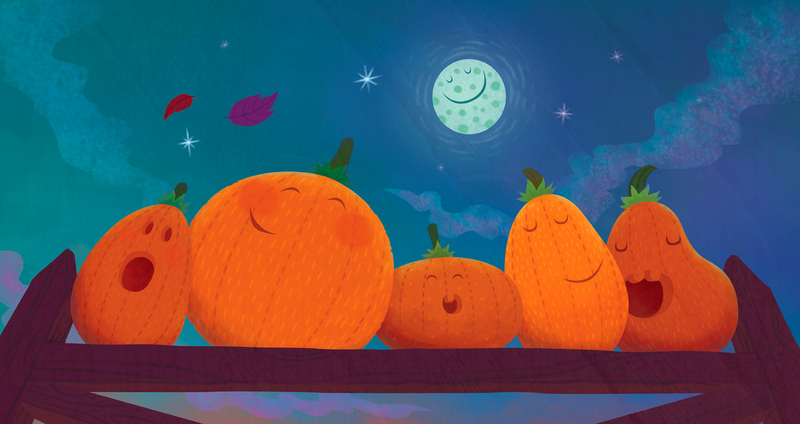 These illustrations are delightful! I can't wait to read this book; it sounds adorable! Loved learning more about Ben. Thanks Elaine and Sylvia for this wonderful interview and for the glimpses of Ben's work that you included! Just amazing! What a great interview. I'm so glad to see this interview...one of my children has dreams of a life in illustrating and I work with middle school students. They need to see that it's possible. This interview is very readable for them and inspiring. Thank you! Wow! So much eye-catching color and detail in your work. Thanks for sharing your talents with us. Love your art and I can't wait to read this one! 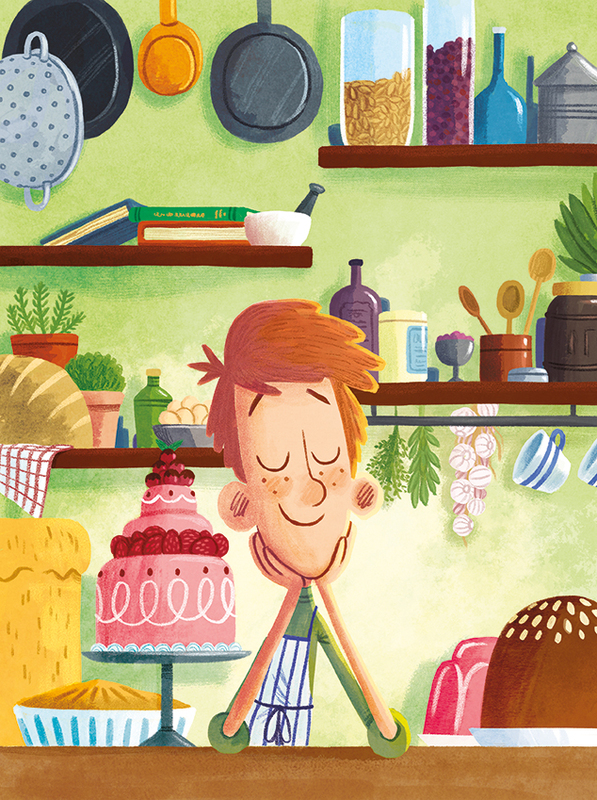 Love your illustrations for A COOKED-UP FAIRY TALE! I can't wait to read this one! Thanks for sharing your experiences with us!